Chris Martin's late penalty earned promotion-chasing Derby a draw against unbeaten Championship leaders Brighton. James Wilson flicked home his second goal in two starts to put the visitors ahead against the run of play, but Bradley Johnson's far-post header levelled matters by half-time. Rajiv van La Parra's strike, after a swift counter-attack, looked to have secured victory for the Seagulls. But Martin made it 2-2 after Gordon Greer fouled Johnny Russell. Martin's coolly taken spot-kick denied Brighton a win, but they remain unbeaten in 20 league games this season and stay two points clear at the top of the table after Middlesbrough's goalless draw away at Birmingham City. 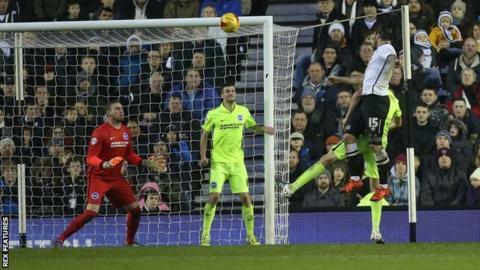 The fine run looked in doubt early on as Derby, who drop a place to fourth, could have been ahead inside a minute through a Tom Ince strike that was deflected wide. It set the tone for a bright start by the hosts with Martin having a shot saved, and Jason Shackell seeing a header cleared off the line before Ince volleyed straight at goalkeeper David Stockdale. Brighton were lively on the break and went in front when on-loan Manchester United striker Wilson slotted the ball in from Jamie Murphy's fine cross following good work by Inigo Calderon. Derby, who themselves have only lost twice in the league, slowly recovered and Johnson's towering header from Jacob Butterfield's deep corner deservedly brought them level. Both sides struggled to create clear chances after the interval, but Brighton's quality on the break was apparent again when Dutch substitute Van La Parra sent the ball past keeper Lee Grant after Johnson was dispossessed in midfield. Martin almost levelled after a sloppy backpass before scoring his first goal in seven games when his 88th-minute penalty beat Stockdale. "We didn't deserve to lose the game, our start was very positive and then they produced a real moment of quality with a well taken goal against the run of play. "A lot of credit goes to our players for not giving up, to keep going, and it was a cool finish from Chris (Martin) under real pressure. They had a difficult game to today and our players afterwards felt like it was a loss. "We have a good record at home and that's the standards we are working towards but overall it's a hard fought point and I would have been really disappointed if we had lost that game." (On the late penalty) "I thought it was very harsh. Unless somebody shows me a different angle, from the one I've seen there's no doubt Gordon dives in because he has to but I don't see contact. "The win would have meant a lot to us and we are disappointed but I think you have to give our players credit to come here against a team on such a good run with the quality they've got and I don't think anyone would have begrudged us the win." Match ends, Derby County 2, Brighton and Hove Albion 2. Second Half ends, Derby County 2, Brighton and Hove Albion 2. Corner, Brighton and Hove Albion. Conceded by Jason Shackell. Hand ball by Bobby Zamora (Brighton and Hove Albion). Jamie Murphy (Brighton and Hove Albion) wins a free kick in the defensive half. Goal! Derby County 2, Brighton and Hove Albion 2. Chris Martin (Derby County) converts the penalty with a right footed shot to the bottom left corner. Penalty Derby County. Johnny Russell draws a foul in the penalty area. Attempt missed. Jason Shackell (Derby County) header from the centre of the box is close, but misses to the left. Assisted by Johnny Russell with a cross following a corner. Corner, Derby County. Conceded by David Stockdale. Substitution, Brighton and Hove Albion. Rohan Ince replaces Tomer Hemed. Substitution, Brighton and Hove Albion. Bobby Zamora replaces James Wilson. Attempt saved. Johnny Russell (Derby County) left footed shot from the left side of the box is saved in the top right corner. Assisted by Chris Martin. Substitution, Derby County. Darren Bent replaces George Thorne. Goal! Derby County 1, Brighton and Hove Albion 2. Rajiv van La Parra (Brighton and Hove Albion) right footed shot from the right side of the box to the top right corner. Assisted by Dale Stephens. Attempt blocked. Tomer Hemed (Brighton and Hove Albion) right footed shot from the centre of the box is blocked. Assisted by James Wilson with a headed pass. Jamie Murphy (Brighton and Hove Albion) wins a free kick in the attacking half. Offside, Brighton and Hove Albion. Lewis Dunk tries a through ball, but Tomer Hemed is caught offside. Corner, Brighton and Hove Albion. Conceded by Lee Grant. Attempt missed. Tom Ince (Derby County) left footed shot from the centre of the box misses to the left. Assisted by Jacob Butterfield. Attempt missed. Tom Ince (Derby County) left footed shot from the centre of the box is close, but misses to the left. Assisted by Chris Martin.